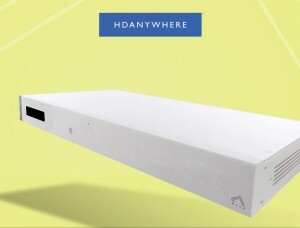 HDanywhere have expanded their mHub family, introducing a slimline mHub 2K 1×4 HDMI splitter with local HDMI out aimed at small to mid-scale projects for homeowners who want multiroom HDTV without having to invest in a full-blown costly matrix system, and the mHub 2K 8×8 matrix, delivering Full HD 1080p video, stereo pr multichannel audio and two-way IR up to 50m / 164 ft over a single Cat6 cable from eight source devices to eight displays. Comprised of a central hub and four display receivers, the mHub 2K 1×4 HDMI splitter delivers Full HD 1080p@60Hz up to 50m over a single Cat cable from one HDMI set top box to four displays with two-way IR. The local HDMI out allows for the integration of a fifth display, as the splitter’s small form factor means that it can be neatly located near the primary household TV. Alternatively it can be used for an AVR in a multichannel zone or can be used for stacking several mHub 2K 1x4s to enable distribution to more screens. Both the 1×4 and the 8×8 are available to order online, or with full installation, including design and wiring of the infrastructure for both residential and commercial properties in and around London. Visit the HDanywhere™ dedicated page or enquiry about HDanywhere™ design and installation.